You already have a space for the laundry and you want to design it. You are designing completely from scratch and need to decide how much space to dedicate to your laundry room and where to locate your laundry room. The approach is much the same for both situations – just use a bit of common sense to tweak the process depending on your circumstances. 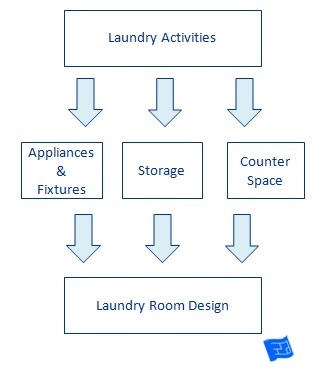 The laundry room design process is based on the laundry room activities discussed over on the laundry room design page. The first step in 'how to design a laundry room' is to figure out where the washing machine and tumble dryer will be located. There’s quite a difference in laundry appliance dimensions across the world. Take a look at the laundry room dimensions page for more on this. Front loaders or top loaders? If you're in the position to buy new laundry appliances you have a choice to make. Here's a few points to consider. With a front loader the appliances can be stacked. I know that stacking systems with a top loading machine exist on the market but this comes as a whole unit so once stacked, always stacked. If there's two separate appliances you can change the layout if you move house or remodel your laundry room. With front loaders the top can be used as a surface for folding and storage. Forgotten that sock? Not a problem if you've got a top loader, you just chuck it in mid-cycle. Have a think about whether your laundry room design will work better if the laundry appliances are stacked and whether or not you want to install the appliances on top of a pedestal (a bit more on pedestals in the box below). Remember the water supply for your washing machine (you may need both hot and cold supplies - check your machine specs) and air extraction for your tumble dryer (if required) when you're designing your laundry room. It's your decision whether or not you get your washing machine and tumble dryer built-in with surrounding cabinetry. The tops of the appliances are finished so many people leave them as is. Should I get a pedestal for my laundry appliances? The first thing to check is whether or not you can fit the laundry basket you intend to use under the door of the appliance. It makes things much quicker and easier if you can just scoop out the washing into a basket below rather than having to take it out handful by handful out and place it in the basket. My recommendation is that if you can't scoop, get a pedestal. Pro - You won't need to bend down so far - but you can use a little stool if you like. Con - The cost extra - but there's no stopping you creating some sort of base of your own to raise the appliances. Pro - Storage underneath the machine. Con - the height of the shelf above the appliances will be too high for folding. Pro - Pedestals raise the height of the appliances to just under top cabinet height so they can be given a built in look quite cheaply. Take a look at these pedestal and laundry dimensions to see what I mean. Do you need a draining board? Would a deep sink be useful. Often the laundry room sink is used for filling buckets for floor washing and it helps if the sink and faucet arrangement makes it easy to fill a bucket and empty out dirty water without it splashing. Depending on where you're planning to locate the laundry room there might be a sink nearby in the kitchen or in a bathroom. Even if you have a fabulous laundry room, whoever does the ironing may choose to iron in another room – or maybe you go in for extreme ironing (Google it for fun if you have a spare minute or two!). Make sure that you have a power point installed nearby to your favorite ironing spot to prevent an extension lead being added to your laundry basket. Wherever the ironing happens, it is likely that you’ll be storing the iron and ironing board in the laundry room. Which of these storage options would work best in your laundry room? A storage stand mounted on the wall (these often incorporate the iron as well). A storage stand mounted inside a cupboard door. This is a nice option because it hides everything away. It means that the inside of the cupboard has to be designed to make sure that there is adequate space between the door and the cupboard shelves to accommodate the ironing board. Otherwise you’ll have a cupboard door that won’t close. Obviously the door needs to be able to take the weight of the ironing board to check that before you wreck the hinges. A tall gap in the cabinetry can be an elegant and inexpensive solution. Or you could think about a pull out ironing cabinet – wither a drawer or a pull down. If the ironing is done in the laundry room a TV or radio can be a pleasant addition to the room - just remember to plan for the power points and data points. I think it's a gas that in laundry room pictures you hardly ever see an ironing board, or a cupboard big enough to store the ironing board in. There's a commentary on real life laundry room pictures over on laundry room design ideas. If you're going flat out in your laundry room design you might include a mangle iron or a drying cabinet. How about a laundry chute? 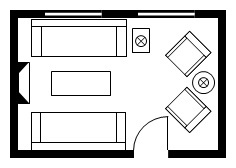 The X crossed box in the illustration below is the floor plan symbol for a laundry chute. For this step you'll need to have a think about how you’ll handle the ‘laundry process’ for want of a better word. If you live in a small household there may be no need for storage in the laundry room itself for clothes waiting to be washed. If you’ve got several people in the home the likelihood is you’ll need a hamper to two to store and sort your clothes before you wash them. Why not make it easy for your family to get their clothes into the 'laundry process'. You could choose to have laundry hampers in everyone's bedrooms, or a central hamper in a hallway or in the bathroom. Or maybe a laundry chute. Whatever it is, work out a system and only wash those items that make it into the 'laundry process' via the correct method - not the Mom picks it up off the floor method! This is just about making sure you've got cupboard, surface or shelf space for the stuff you need to do the washing and drying like washing baskets and detergents, dryer sheets, pre-wash treatments etc. How much drying space do you need and where will it be? The best way to figure out how much drying space you need is to look at how you’re drying your washing right now. Measure out how many feet or meters you're taking up. Buying a drying cabinet (link) or building one. Using different drying gadgets to make changes to drying requirements eg – smalls peg rack, a wardrobe bar with hangars, a shiela maid hanging from the ceiling, using drying space that hangs from doors or walls. You might have other drying gadgets like nets that make it easier to dry things flat. The drying area should be well ventilated so consider fitting an extraction fan. There's evidence that without adequate ventilation drying laundry inside your home could be bad for your health. So after all that work, when everything smells great and is folded neatly there needs to be somewhere to keep it that way. This is especially important if your laundry does double duty as a mud room or if you have pets. There's nothing worse than a muddy paw print on clean laundry! Perhaps in your home the laundry gets put away exactly where it belongs as soon as it's done. At my place it tends to sit around in the laundry for a few days before I get round to handing it out to everyone to put away. Want another way to lift the load slightly on the person that usually does the laundry? How about having a shelf in the laundry for each member of the household where they can find their clean laundry. It saves someone else the job of carting the laundry round the house and putting it away. You'll need some counter space for folding and sorting and most of the time some of the laundry items like baskets and detergents end up on the counter. Squeeze in as much counter space as you can. It's likely that it would be a depth of 24 inches in line with kitchen cabinet sizes but you could get away with a depth of 12 inches if you're short on space. The kitchen or dining table also makes a great folding space if you don't have room in your laundry room. Where should I locate my laundry room?